White Wolf : Amazing Raven Lays Back And Enjoys Playing With A Snowball. 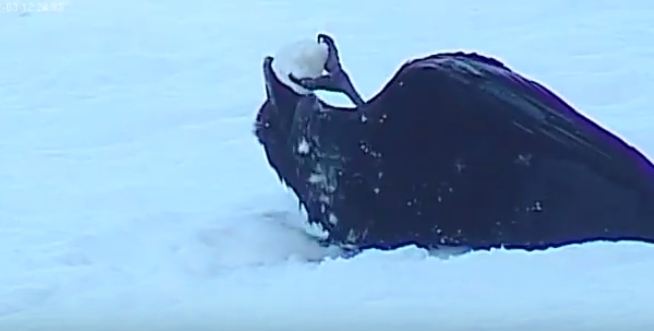 Amazing Raven Lays Back And Enjoys Playing With A Snowball. The intriguing Common Raven has accompanied people around the Northern Hemisphere for centuries, following their wagons, sleds, sleighs, and hunting parties in hopes of a quick meal. Ravens are among the smartest of all birds, gaining a reputation for solving ever more complicated problems invented by ever more creative scientists. Common Ravens aren’t as social as crows; you tend to see them alone or in pairs except at food sources like landfills. Ravens are confident, inquisitive birds that strut around or occasionally bound forward with light, two-footed hops. In flight they are buoyant and graceful, interspersing soaring, gliding, and slow flaps. When driving, keep an eye out for them on the roadsides, gathered at roadkill, or flying straight down the center line on the lookout. Responses to "Amazing Raven Lays Back And Enjoys Playing With A Snowball." I wonder if this is about getting a drink of water in the winter? Compacts the snow to make it denser and then eats it? Pretty ingenious! So smart. Not that I'm saying they don't play, which is cool too. Love crows and ravens! I have to say than you for the enlightenment that you have brought to me over the years.. Always something to ponder, admire and simply adore.. I can spend hours just watching the birds that we in Western New York get in the winter time. Even the blue jays and the aggression that they show the other birds is still a sight for me. We have downy woodpeckers, mourning doves, titmice, chickadees and not sure, but I believe that the ravens have gone somewhere warm...don't blame them.